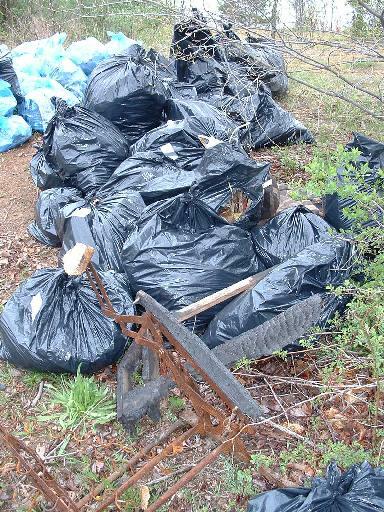 The cleanup was part of the Potomac River basin cleanup sponsored annually by the Alice Ferguson Foundation. The site selected by CCRIC was the Indian Creek adjacent to the "concrete mountain", alongside Cherrywood Lane in west Greenbelt. Two volunteeers are signing in at the CCRIC tent across the street from the cleanup site (in background). The cleanup site is downhill from the curbside and volunteeers not only have to retrieve trash from the river and its banks but have to carry everything up to the road for pick-up by Public Works. Recyclables (light blue bags) were collected separately from trash (black bags), metal bed frames, tires and other bulky debris. 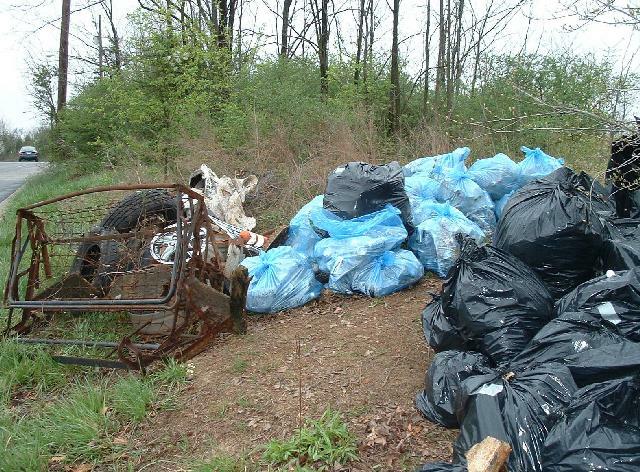 After two hours' work our volunteers collected 30 bags, each of trash and recyclables, and various big items.